El Niño translates to ‘the boy‘ and in his case, the child is unwanted. El Niño is a periodic climate phenomenon that occurs when a vast pool of water in the western tropical Pacific Ocean becomes abnormally warm. The resulting changes in ocean currents and winds affect the world’s weather and climate. What set the most recent 2015 to 2016 El Niño apart is that it was one of the strongest ever, which is related to the warming of the Pacific Ocean. The recurrent El Niño is a much older phenomenon than the recent increase in CO2 emissions and global warming after the industrial revolution. CO2 concentration in the atmosphere has increased from 360 ppm in 1990 to over 400 ppm today. This has nothing to do with El Niño. But the hypothesis that global warming increases the strength of the Niños is gaining ground. Per capita, historically and today, the largest emitters of CO2 are the rich countries. There is a Climate Debt from North to South – which the EJOLT team visualised in this map. Rikard Warlenius wrote that the concept of ecological debt has been used as a biophysical measure, a legal instrument and a distributional principle. But at the COP21 in Paris, the rich countries imposed a clause of “lack of liability” for climate change, which boils down to denying history. This is unjust. A strong El Niño increases the injustice. Within the Global South, the poorest part suffers the most. Sub-Sahara Africa has seen some of the biggest droughts and related crop failures in history – with bread basket South Africa showing a 36% drop in grain output. The UN’s World Food Programme said that 40 million people in rural areas and 9 million in urban centres who live in the drought-affected parts of Zimbabwe, Mozambique, South Africa, Zambia, Malawi and Swaziland will need food assistance in the next year. But India and many parts of south-east Asia have also been struggling with a severe heat wave, with Cambodia and Laos setting all-time temperature records. All schools in Delhi have been told to take ‘mandatory summer vacation’ and the heat waves and a drought have affected 330 million people across India alone. The UN’s World Food Program said that nearly 100 million people in the Global South face food and water shortages. That goes far beyond some local catastrophes. In the first half of May, a global wave of mass actions targeted the world’s most dangerous fossil fuel projects. 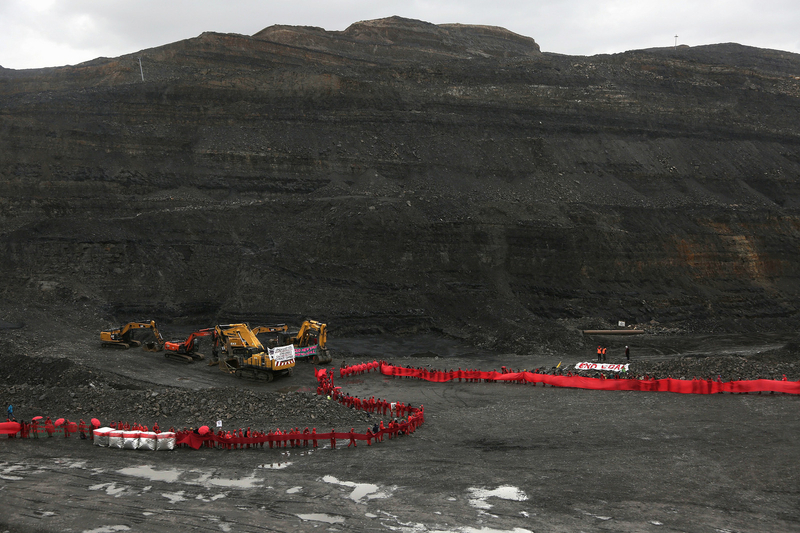 The organisers claim that it is the “ Largest civil disobedience in the history of the environmental movement“. Masses of activists have taken recourse to direct action in dozens of places to physically keep coal in the hole, oil is the soil and gas under the grass. In Australia, no coal has come in or out of the world’s largest coal port. 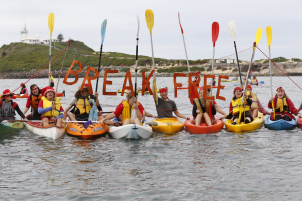 Kayakers have blocked the harbour entrance while 60 people blocked a critical rail crossing preventing any coal from getting to port. In the UK, hundreds have shut down the largest open cast coal mine. But is it really the largest civil disobedience in the history of the environmental movement? Or is it only the case for white and planet-caring people with a very useful weekend hobby? Similar struggles are happening all over the Global South by people whose lives depend on the outcome of the struggle. The motive may be different, but the action is often the same: stopping a dirty coal mine through direct action. The Fuleni proposed open cast coal mine in Kwa Zulu Natal stands very near the border of the very valuable Hluhluwe-iMfolozi Wilderness area. There is a confluence of protests from conservationists and local people, who use blockades to stop the preparations for the mine. In violation of sacred traditional protocol, the company already dug up the graves and remains of ancestors to get at the coal. Hundreds of people have been forced to leave their lands and seen their chiefs and traditional healers compromised, allowing the company’s operations to pollute water, air and land in the area. Dozens of similar cases take place in Latin America, Africa and in Asia. In India alone, the EJAtlas mapped the details of 48 struggles for climate justice. No less than 26 of these conflicts involved blockades of a fossil fuel operation. Very few of these struggles are about stopping climate change – rather about protecting the local environment. But the target and the strategy to defeat the coal industry are often the same. What has changed in recent years is that people in the global North have started to lift their courage to the level of the people in the South who are doing “break free” actions as an immediate survival strategy long before Northeners joined them, using climate justice as motive. It’s the coming together of these two struggles that is already making life hard for coal companies worldwide. In April, the world’s largest coal producer, Peabody, filed for bankruptcy. Across the world, ever more people are showing the courage to confront polluters where they are most powerful — from the halls of power to the wells and mines themselves. For people in the South, the motive is often a battle to protect the local environment on which they depend for their livelihoods. In the North the bottom line is that in order to address the current climate crisis and keep global warming below 1.5C, fossil fuel projects just need to be shelved. More details on the ongoing actions are now on the Break Free website.